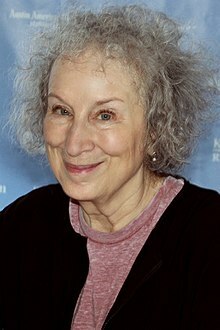 Margaret Eleanor Atwood, CC OOnt FRSC (born November 18, 1939) is a Canadian poet, novelist, leeterar creetic, essayist, an environmental activist. She is a winner o the Arthur C. Clarke Awaird an Prince o Asturias Awaird for Leeteratur, haes been shortleetit for the Booker Prize five times, winnin ance, an haes been a finalist for the Govrenor General's Awaird several times, winnin twace. In 2001, she wis inductit intae Canada's Walk of Fame. She is also a founder of the Writers' Trust of Canada, a non-profit literary organization that seeks to encourage Canada's writing community. Amang innumerable contreibutions tae Canadian leeteratur, she wis a foondin trustee o the Griffin Poetry Prize. ↑ "Canada's Walk of Fame Inducts Margaret Atwood". Canada's Walk of Fame. ↑ "About Us: The Writers' Trust of Canada". Retrieved February 18, 2014. ↑ "Griffin Poetry Prize: The Griffin Trust: Trustees". Retrieved June 8, 2014. This page wis last eeditit on 9 Apryle 2017, at 00:03.